Our contractor called us on Friday to let us know that we were next on his list and that he was about a week away from being available. This kicked us into high gear. If he was going to be starting his work in a week, we had lots to do. We spent Saturday shopping for all of the essentials. Here's what we settled on for faucet, sink, hood, pulls, and knobs. 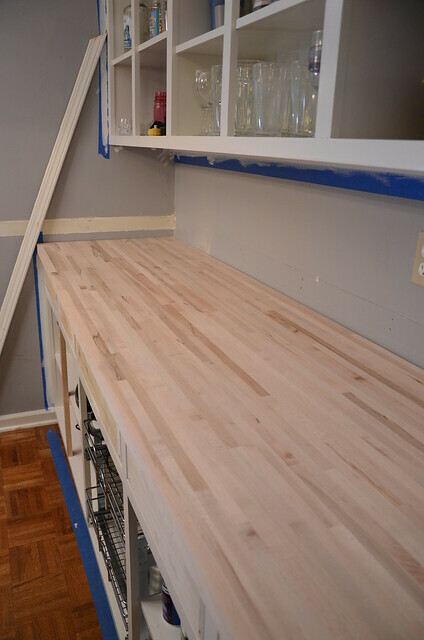 We also purchased the butcherblock countertop. We still need to stain and seal it. On Sunday we started cleaning out our cabinets and moving things to the other side of the room. We will reorganize everything once the construction is completed. We sure did fill up all of those cabinets fast. 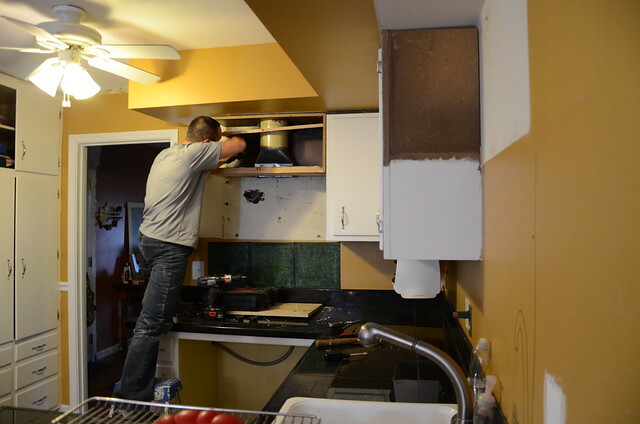 Then by Sunday afternoon we were ready to take down the upper cabinets. It already feels so open. I can't wait to get rid of that soffitt. The opening is going to really change the way everything looks too. We hope to have everything demoed (is that a word) by the time he starts work, so he can come in and get to work. He will make the opening between the two rooms, remove the soffit and drywall the ceiling. He is also going to build all the lower cabinets and possibly an island. We have some electrical work that we might get him to do too. Hopefully he will be able to get all of this done in a week. Then we can order countertops. We still need to settle on tile for the backsplash. We are planning on tiling all the way to the ceiling on the wall with the hood. We will have to tile before we can install the hood. It still seems a bit surreal. It will be so nice to have a big hunk of the work done, even if we will still have lots of stuff to do after he is finished. 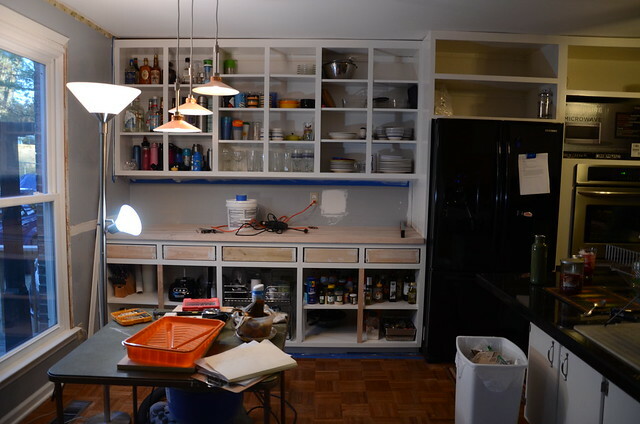 have you been following along Young House Love's kitchen re-do? if not - go over and look at their goodness. it is amazing. i'm so in love with their kitchen although it totally wouldn't work in our style of house...still, gorgeous. We redid our kitchen about 4 years ago and it made such a difference. As much cooking as you do, you'll enjoy it so much! Love your choices! 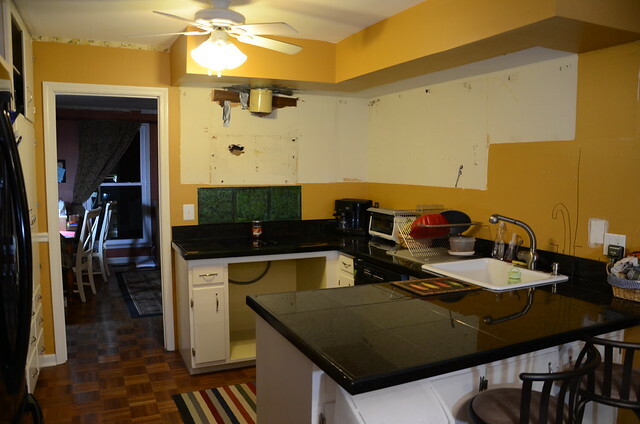 We're wanting to get butcher block countertops, too. Where'd you get yours? I hope it is going well! The butcher block counter looks great! So jealous of all that extra storage. Webtrackker Technology Pvt. Ltd. Offers the Best Salesforce Training Institutes in Noida with the aid of experts with one hundred% job help. For greater data name: +91 - 8802820025, 0120-433-0760. Webtrackker Technology presents Best Salesforce Training Institutes in Noida as in line with the contemporary industry necessities. Our education applications will allow specialists to price placements in MNCs.